Brent offers the utmost in precision speed controls, heavy-duty construction, and an unsurpassed 10-year warranty on all of its power wheel models. Both Brent Models B and C feature standard forward, neutral, and reversing options, controlled by a long-lasting toggle switch for easy adjustment while throwing. The modular-style foot pedal, motor, and control box make trouble-shooting and repair a breeze. The poly v belt drive system has been a favorite among teachers and potters for more than 40 years. 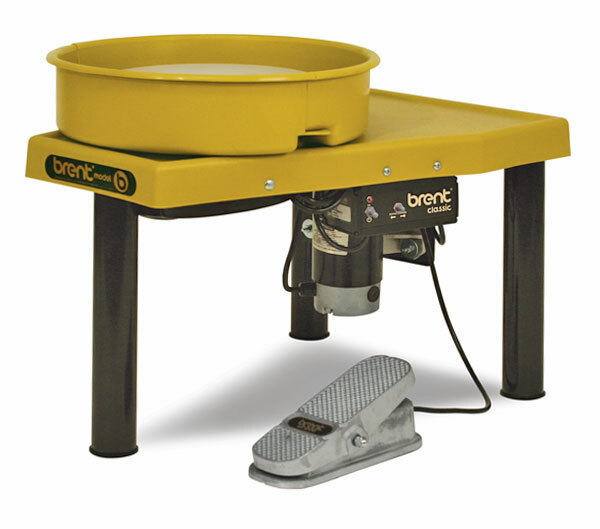 Brent Power Wheels are designed to withstand demanding daily use in classroom and studio environments. They feature sturdy steel construction throughout, ensuring stability. Brent Booties — Raise your wheel height for customized comfort in increments of 2" (5 cm) or 4" (10 cm) with these easy-to-insert steel extensions. Use them with all Brent Pottery Wheels, including the Ie wheels built after 2009. FOB Factory. Brent Model B — The Model B is designed to meet the needs of schools and studio potters. Competitively priced, this wheel is quiet and solid under 150 lb (68 kg) of clay. A 1/2 HP motor provides the power and weight necessary for school and institutional use, along with the durability of the standard Brent wheel design. A splash pan, 12" (31 cm) Plasti-Bat, and How to Throw on a Potter's Wheel DVD are included. 10-year limited warranty. Weighs 112 lb (51 kg). CE-certified. Truck shipment is required. Brent Model C — The standard that no one can match! The Model C continuously handles 225 lb (102 kg) of clay, with a 3/4 HP motor that sustains daily student use for decades. Its poly v belt drive system maintains speeds from 0–240 rpm. A 14" (36 cm) cast aluminum wheel head, splash pan, 14" (36 cm) Plasti-Bat and How to Throw on a Potter's Wheel DVD are included. 10-year warranty. Weighs 117 lb (53 kg). CE-certified. Truck shipment is required. FOB factory. Plastic Splash Pans — These two-piece, unbreakable polyethylene plastic splash pans snap into place under the wheel head. They are easy to remove and clean without removing bolts, screws, pins, or the wheel head. They measure 17-1/2" in diameter × 4-1/2" high (44 cm × 11 cm). Optional Seat — This seat attaches directly to Brent Model B, C, CXC, EX, and IE/IE-X wheels manufactured after January 2009, and is adjustable both for height and distance from the wheel head. For Warranty Registration and Manufacturer's Rebate , please click here. ® brent is a registered trademark. ® brent Built for Life is a registered trademark.® Plasti-Bat is a registered trademark. Brent "built for life" Potter's Wheels are recognized as the highest quality and longest lasting potter's wheels on the market. This video shows the features and benefits of Brent wheels and will help you select the right wheel for your needs.